Cactus Forest Flood Mitigation and Mapping (AZ) | WEST Consultants, Inc. Located just southeast of the city of Florence, Arizona, Cactus Forest is a rural area that has experienced increased residential development in recent years. The lack of detailed floodplain information combined with the rural nature of this area and its distributed channel topography has resulted in significant challenges for permitting and enforcement. In addition, some residents have experienced flood-related problems in the more densely developed portions of Cactus Forest. The Flood Mitigation and Mapping Study provided detailed hydrologic, hydraulic, and flood mitigation solutions for approximately 164 square miles of Florence watershed. The project had two main objectives. The first was to revise the then current Flood Insurance Rate Maps and Flood Insurance Study for the area. The second objective was to investigate the existing flooding problems and develop mitigation project alternatives. To accomplish the two main objectives, the study area was divided into three basins that were modeled separately. The hydrology and hydraulics for two of the basins were modeled using FLO-2D, while the hydrology for the third basin was modeled using HEC-HMS and the hydraulics were modeled using FLO-2D. Novel modeling approaches such as interflow between multiple models along with the implementation of a rill and gully routine were used in the development of the models. In addition to these innovative modeling techniques, more traditional components such as spatially-varied infiltration, flow obstructions, spatially-varied roughness, walls, embankments, and hydraulic structures were modeled. 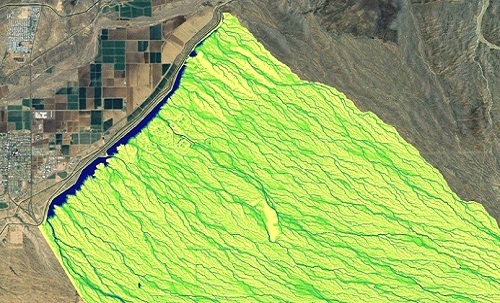 To meet the first study objective, FEMA base flood elevations and extents along Bogart Wash were defined using the results of the HEC-HMS and FLO-2D modeling effort. The second study objective, identifying and evaluating flood mitigation alternatives, was met by using the two FLO-2D models that simulated both the hydrology and hydraulics of the watersheds in concert with information collected during field investigations and public outreach meetings. The flooding issues along with the proposed flood mitigation solutions were summarized in the final report to Pinal County.